T/N: In Chinese, the 穿 in time travel is the same character as the 穿 in wear clothes. “Because… If you don’t wear clothes (穿 chuan)… You’ll catch a cold…” – Qing Qiao’s servant girl, Dong Xi. What is a Benz? Beautiful men step aside. As a knowledgable woman who has gone through higher education, how can I tolerate a backward life without a computer, without chocolate, without a flushing toilet bowl? No matter what I must return back to the future! Thus started, Gu Qing Qiao’s silly ridiculous legend, a side-splittingly funny case that started with one bowl of roast pork rice. Here are a few reasons why I like this story as of chapter 33. --- How the story flawlessly shifts from seriousness or romance or sadness to humor and back. --- Qing Qiao (MC) and Duan Yu's interactions. They have these wonderful moments where they're so honest with each other and moments when they're just acting out their roles and moments where they think they're having one conversation, but its two different conversations. --- Qing Qiao's thoughts as a girl who's transmigrated. She's not a girl who has lofty, modern ideals of everyone... more>> being equal. She's a girl who misses chocolate and the convenience of flushing toilets and tampons. And her complaints to the author when reality doesn't match the expectations she has after reading transmigration books is hilarious. In most transmigration novels, there's never any negative consequence to the MC because of her future knowledge, so the plot twist in chapter 28 that happened because Qing Qiao is a person from the modern world was super satisfying and novel. --- The side characters' POVs. Although it must be so pitiful to be Duan Yu's guards after Duan Yu met QingQiao. I imagine them having nightly commiseration session and thoughts of finding a new employer. In short, read this story if you've already read a lot of transmigration novels and want to read about a main character who misses the modern world and never gives up on going back to her original life and has many hilariously silly and ridiculous thoughts. 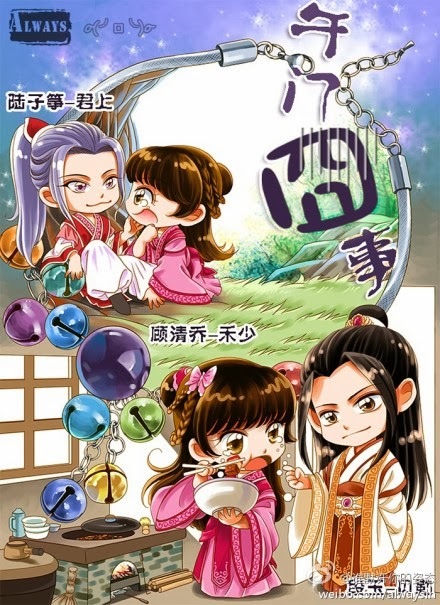 Since the author constantly subverts the common tropes in transmigration novels through the story, I think its very reasonable and not completely unexpected when Qing Qiao doesn't end up with Lu Zi Zheng. It's very telling that throughout the story, he keeps asking her, do you trust me? And she always says no or not completely. --- Qing Qiao's conversations with Zi Zheng. There are these funny moments when Zi Zheng is totally misunderstanding Qing Qiao's words (they're only harmless misunderstandings) and these sweet dream-like moments. They seem so perfect for each other. Or, to to put it another way, no one is more suitable for Zi Zheng, then Qing Qiao. He's suppose to be this mysterious character, but Qing Qiao brings him to her level and makes him human. I'm liking the main character and the funny plot. The translator is doing a great job at translating, he/she even links to references. I will rate it 5 for now, so other can also try it out, instead of abandoning it just because it hasn't started stacking up with chapters yet. Will rate again when more chapters are up. Keep up the good work. I was so head over heels in love with this book. Ive fallen fot the second ML but after knowing that he didn't win the MC after all the sacrifices and struggles he faces for her. I was so disappointed, he is clearly the real ML but for reason the ending ends with pure greed. Choosing selfishness over love. Huhuhu😥😥I cant get over the fact that the one who wins the MC just appeared for a few chapters and getting the highlight in the end. LZ I will always be on your side. It's really good, it's the type of novel that leave you bursting with laughter, and hiding sinister plot line underneath. MC is transmigrating into the past, and make us laugh with her antics, until the plot start to unravel. A lot of jab at other common transmigration plot, like how illogical for a woman confined in bourduir to invent things like bomb, unique dish, weird (but supposedly common now) fact and tidbits. I expected a funny ride but cried buckets instead. I don’t want to say anything more but it’s a very good novel. Highly recommended! I thought this is a funny, fluffy light novel I Will Be ready.. But Not so much.. It does have more sides to it.. It has a Touch of „grabing your Hand and dragging u away“ Touch.! I Highlight recommend it to u if you liked gyhadua! !